Welcome to the Internet's most extensive E-Meter site. 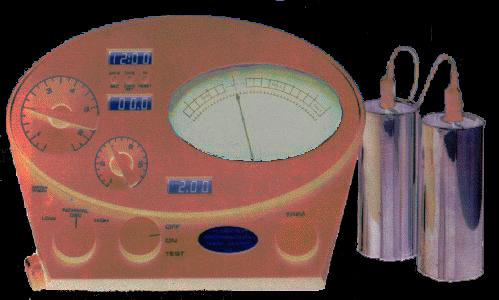 The device above is a Hubbard electro-psychometer (E-meter): a crude lie detector used by Scientology auditors (counselors) to examine a person's mental state. Scientologists claim the device allows people to "see a thought". In the hands of a trained auditor, they believe it can uncover "hidden crimes". John Travolta swears by it. And so do Jenna Elfman and Priscilla Presley. Here you will learn the truth about this device. The Book Introducing the E-Meter. Gives basic data on the Mark V.
The E-Meter, chapter 18 of Paulette Cooper's historic book, The Scandal Of Scientology. alt.religion.scientology FAQ entry on the E_Meter. What's a Wheatstone Bridge?, from a post by David Morning. Biophysics and the E-Meter, by Chris Schafmeister. How to Audit Aphids, by Perry Scott. A Study of E-Meter Frequency Response, by Perry Scott. Fraudulent "Electrodiagnostic Devices" are described by Stephen Barrett, M.D., at his award-winning quackwatch.com web site. And check out this page on Radionics, another quack diagnostic "technology". Testimony about the E-meter from a 2009 Scientology trial in Paris. Electroplating and endorphins -- Arnie Lerma's controversial speculations about the biological effects of prolonged exposure to the E-meter's low current. The E-Meter Unveiled, by Chris Owen. ``By itself, this meter does nothing.'' -- Excerpt from a disclaimer found in every E-meter book, and on the device itself. 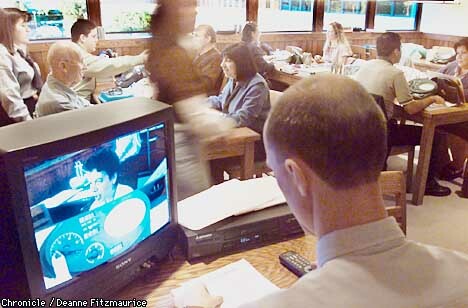 In this photo, a course supervisor monitors the performance of student auditors at a Scientology training facility. Notice that the meter's tone arm is worked with the thumb of the left hand; the right hand is used to take notes. Left-handed auditors must purchase a left-handed E-meter, where the positions of the dials and knobs are reversed. The E-meter drills. A detailed summary of the actual drills used to train Scientology auditors. Professional Metering Course available free online, courtesy of Clearbird, a FreeZoner. The Language of the E-Meter, by L. Kin, offers a good explanation of needle movements and basic auditing procedure. The TRs. Scientology's training routines (actually brainwashing procedures) teach an auditor to suppress all affect (and critical thought) while maintaining positive control over the pre-clear throughout the auditing session. David Alexander answers some questions about E-meter auditing. This photo from the St. Petersburg Times shows an E-meter with the optional remote tone arm to the left. 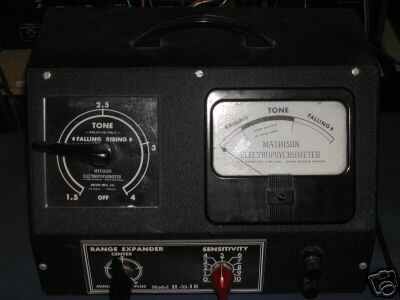 The remote tone arm attachment, sitting to the left of the meter, is used in solo auditing. The person holds the cans in one hand and uses their other hand both to take notes and to work the large knurled knob on the left side of the remote. The knob is geared to the dial on the front of the remote, so moving one also moves the other. Alternatively, the person could move the front dial with their pen. What is metered auditing really like? Robert Kaufman spills the beans in his book Inside Scientology/Dianetics, which the Scientology organization tried to suppress. 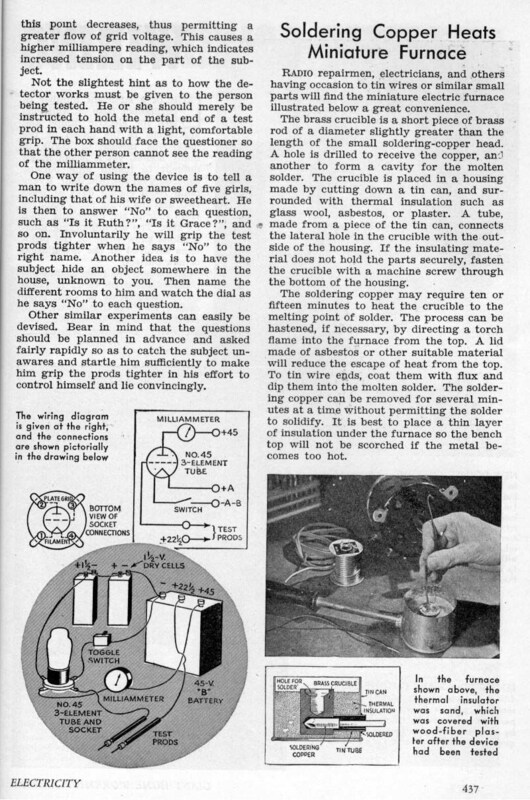 Do-it-yourself lie detector project: 1941 forerunner of the E-meter (2 pages). full size schematic and the component specifications for the diagram at left. Illustrations accompanying US patent # 3,290,589, Device for Measuring and Indicating Changes in Resistance of a Living Body, awarded Dec. 6, 1966 to L. R. Hubbard. Filing date June 7, 1965. Homer Wilson Smith's design for a Mark V E-meter. FreeZone E-meter schematics from Ralph Hilton's tech page. Ralph is also working on a new design with a USB interface, called the C-Meter. A 1981 patent (number 4,300,574) on a more recent design by James Briggs was assigned to Scientology. Koos' E-meter schematic: Koos Nolst Trenite, self-proclaimed "Ambassador for Mankind" and resident kook of alt.religion.scientology, tells us how to build a better E-meter. 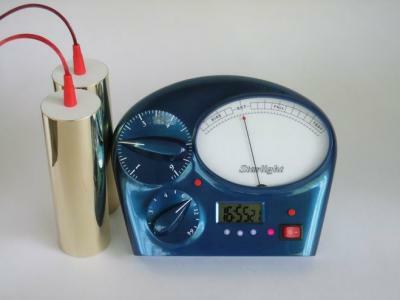 The Starlight meter is an E-meter knockoff offered by a Russian "independent Scientologist" (FreeZoner). 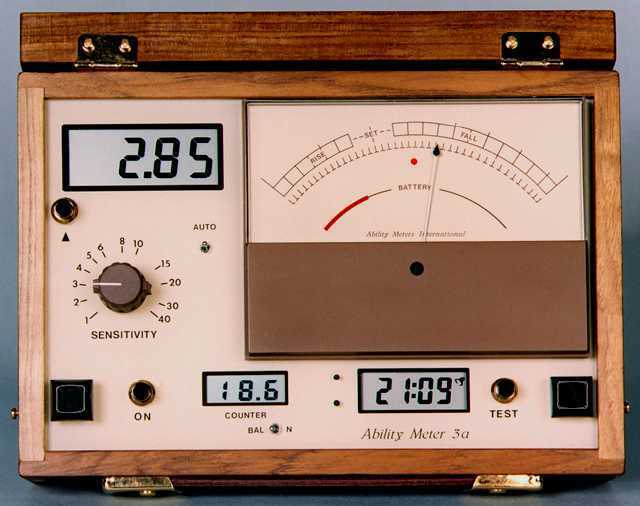 Ability Meters International, a FreeZone group, sells their own version of the E-meter, which looks a lot like the Mark V.
Here's a "clarity meter" offered for $795 by another "squirrel" (un-approved by Scientology) group. 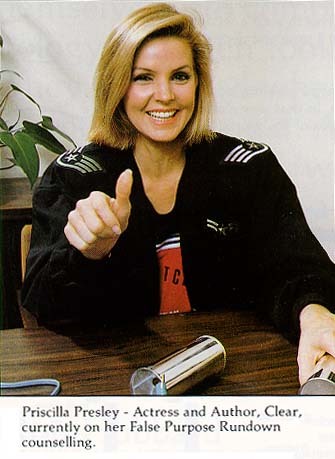 According to ex-Scientologist and long-time critic Monica Pignotti, the Clarity Meter "is used by people who practice Sarge Gerbode's TIR and Metapsychology (see www.tir.org). Sarge is a psychiatrist (!) who is an ex-Scientologist and former mission holder of the Palo Alto mission. He's already had his legal battle with the church and it is my understanding that they made a settlement that he can practice TIR and Metapsychology." 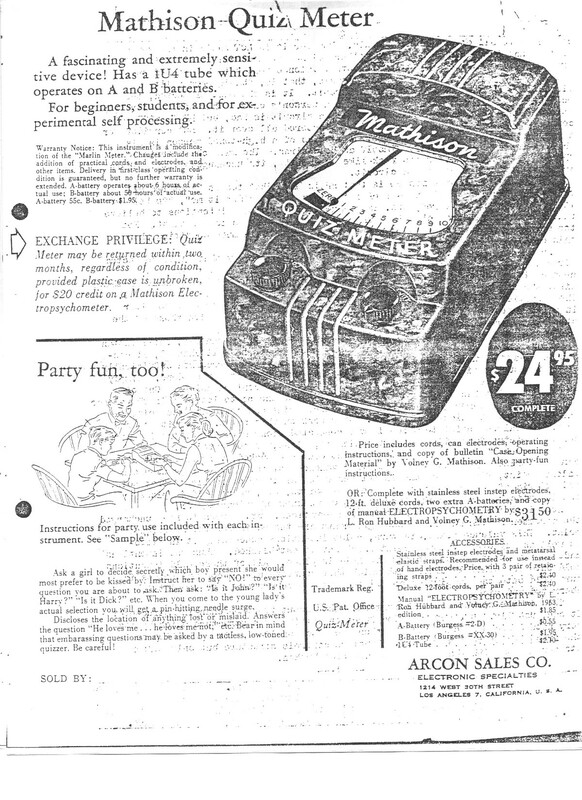 Although Hubbard's name is on the patent application, the E-meter was actually invented by a chiropractor named Volney Mathison, and was originally called the Mathison Model B Electropsychometer. Mathison also marketed a cheaper Mathison Quiz Meter and a manuscript on "Electropsychometry" by L. Ron Hubbard and himself. Here is an excerpt. 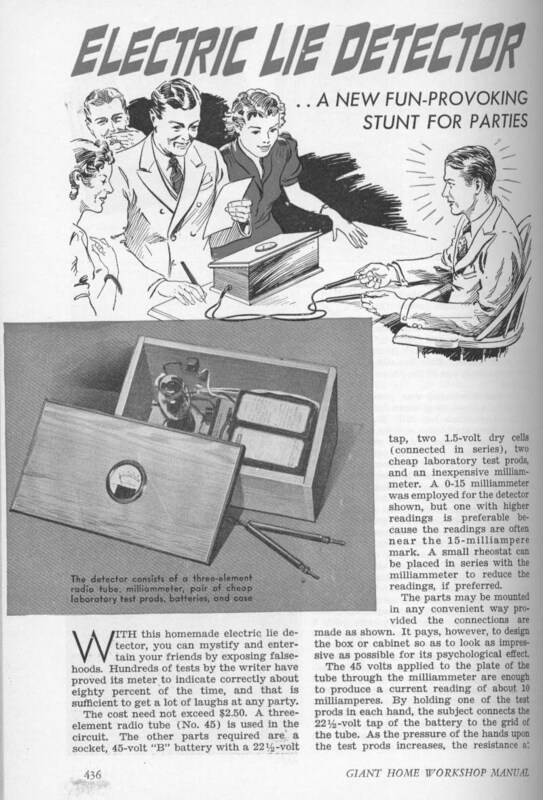 Mathison's Electropsychometer (meter photo) was promoted as an aid to psychotherapy and psychoanalysis, which is anathema to Scientologists! The more modern "bathroom scale" E-Meter design was registered with the US Patent and Trademark Office in 1997 under registration number 2056778. (Thanks to Scientology attorney Samuel D. Rosen, of Paul, Hastings, Janofsky & Walker, for pointing this out.) Here is the trademark registration. 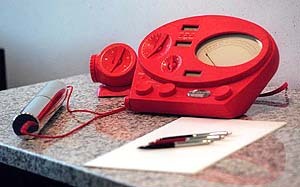 In August 2001, Scientology also registered "E-Meter" as a word mark; the registration is here. But there are many other commercial uses of the term "E-Meter"! It appears the main point of the trademark registration would be to prevent FreeZone groups from marketing their own electropsychometers under this name. Needle actions can be faked. Martin Hunt confessed to faking an F/N (floating needle, a movement that signals the end of an auditing process) by gently squeezing the cans. E-meter drill 9 and drill 13 are supposed to teach auditors to recognize such actions, but they don't always catch them. Pxxxxxx Jxxx and Arnie Lerma have found that a violent needle movement called a rockslam can be produced simply by checking the electrode leads, or by corrosion in the plug contacts. The ``metabolism test'' done at the start of each session has nothing to do with metabolism. The mechanical meter movement is specially designed to bounce around a lot, producing extra ``phenomena'' for the auditor to interpret. The US Food & Drug Administration raided Scientology on January 4, 1963 and seized hundreds of E-meters as illegal medical devices. The incident is described in Jon Atack's book, A Piece of Blue Sky, and in this essay by Stephen Barrett, M.D. Since that time, meters have been required to carry a disclaimer stating that they are purely a religious artifact. This appellate court decision describes the trial and the various witnesses who appeared. This subsequent court decision says in part: "As a matter of formal doctrine, the Church professes to have abandoned any contention that there is a scientific basis for claiming cures resulting from E-meter use. The Church, however, continued widely to circulate Scientology literature such as Government's exhibits 16 and 31, which hold out false scientific and medical promises of certain cure for many types of illnesses." Also see this decision by the US District Court in Minnesota concerning the E-meter and unlawful medical claims. The 9th Circuit reached a similar conclusion, noting that "Labels of disclaimer, to-wit: 'Not intended or effective for the diagnosis, treatment or prevention of any disease,' found on about half of devices, were not controlling in determining whether devices were mislabeled within Federal Food, Drug, and Cosmetic Act, and thus subject to prohibition of importation, but were to be considered together with any extrinsic evidence of intended use of device." The actual ordered E-meter warning was published in Federal food, drug, and cosmetic act: judicial and administrative record, 1969-1974, 1969-1974 FDCA Jud. Rec. (FDLI) 90 (D.D.C. 1971) and 1969-1974 FDCA Jud. Rec. (FDLI) 131 (D.C. Cir. 1973). E-meters are assembled at "Gold Base", Scientology's armed compound in Hemet, California. The St. Petersburg Times reports it takes only 80 minutes to put one together, as the technician shown at left is doing. And for this they charge over $4,000??? 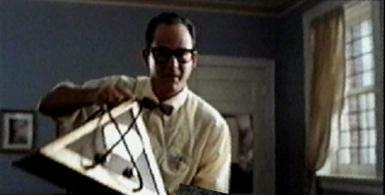 E-Meter-like devices are available from sources outside the Church of Scientology at much lower prices. Rest assured, these fine products are every bit as worthless as the Scientology models. Check out this Google directory for links. But if you want a genuine Scientology E-Meter, you can purchase the "Mark Super VII Quantum™ E-Meter® pastoral counseling device" from the FLAG bookstore. Or pick up a used one on eBay. From the "idols with feet of clay" department: even L. Ron Hubbard had "discreditable reads" (indications of serious aberration or criminality) on the E-Meter. This really ticked him off! Here's how Scientology uses eBay's VERO program to keep ex-members from selling their E-meters. Thanks to attorney Scott Pilutik for permission to reproduce his essay (original version). Click here for a guided tour of the Mark Super VII..
Until the release of the Mark VII Quantum model in 1996, the Hubbard Professional Mark Super VII was the latest (mid-1980s) and most sophisticated model E-meter sold. Scientology doesn't want anyone looking too closely at their "advanced" technology, but this web page offers you a guided tour of the device, with exterior and interior views including the main circuit board, charging circuit, jacks, and data plate. "Hey, it's got Intel inside!" Here is US Patent 8,121,676 detailing some recent (circa 2003) advances in E-meter technology. Interestingly, Hubbard is listed as an inventor, although he died in 1986. What's Next? The Mark VIII Ultra! 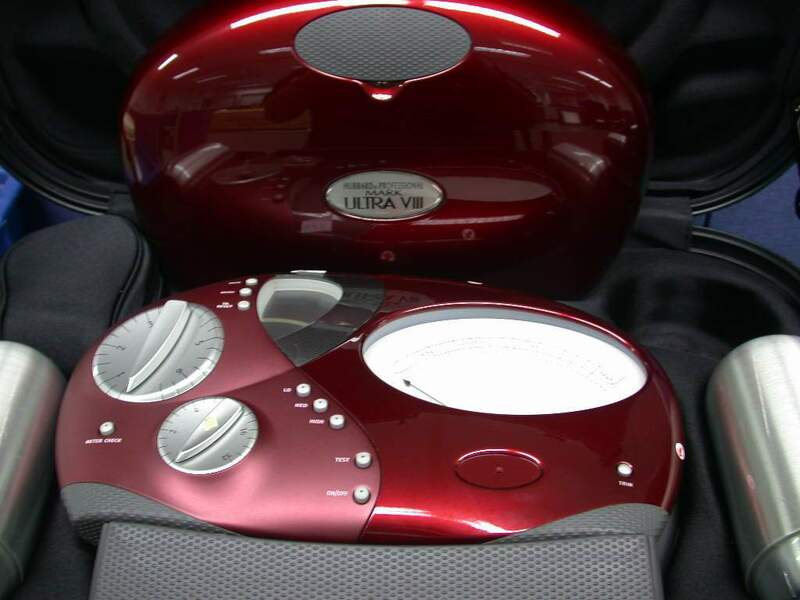 The Mark VIII Ultra E-Meter shown at left (click for larger version), was manufactured in Japan in 2004, on a production line that once made Sony Walkmans. It was finally released in November of 2013. 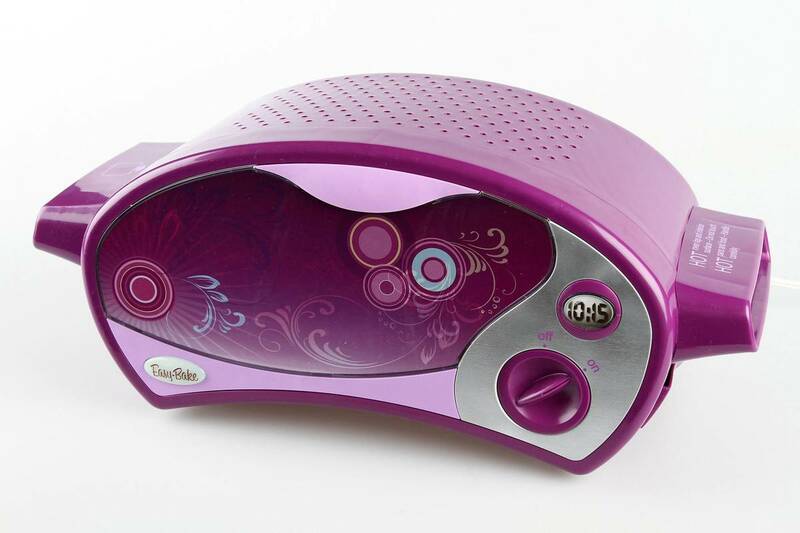 Some folks think the new meter looks a lot like the Easy Bake oven, a popular kid's toy. Here's a drawing of the meter that came out several years before its release. Look at those cans! The TA counter is visible behind the dark plastic wedge at the top center of the meter. This is Russ Bellin's baby. Too bad he stuck with an old-style serial port connector instead of putting in a USB port. Those all had to be replaced before the meter was finally released. There were 20,000 of these white elephants sitting in the Bandini warehouse in Los Angeles, awaiting the day when DM decided to release them to the world. That day finally came in November 2013. For more juicy background details on the meter, read this and this and this. Here is US Patent #6011992, System for Measuring and Indicating Changes in the Resistance of a Living Body, which covers the Mark VIII Ultra and perhaps some of its predecessors. Battery leakage can be a problem. 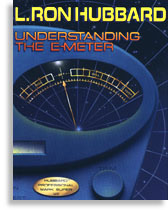 Understanding the E-Meter, an old book by L. Ron Hubbard that Scientology now prints with a more modern sci-fi cover. Here's the book description from the Church of Scientology's own web site: "Is the theta being inside or outside the mest body or both? How big is a theta being in relation to his body?" The answers aren't very convincing, but it's unusual to see Scientologists even asking loopy questions like this in front of raw public, much less purporting to answer them. Bottom line: $50 buys you a load of comic book physics and a revealing look at what constitutes a "scientific explanation" in the cult of Scientology. The Book of E-Meter Drills. Compiled by Mary Sue Hubbard, who later went to jail for a long list of crimes including bugging the IRS and stealing files from the FBI. Her husband L. Ron Hubbard was named as an un-indicted co-conspirator. The Book Introducing the E-Meter. This title no longer seems to be offered by Bridge Publications, but used copies are still available. CoS and Totalitarianism, by Laura Kay Fuller. This excerpt is the section on Technology, which focuses on the E-meter. The full thesis is available here. Travolta Hospitalized with Critically Low E-Meter Reading. Parody piece from The Onion. Chilling fictional account of what can happen to someone who gets too much auditing. This web site endorsed (not!) by Koos Nolst Trenite, official kook-in-residence of alt.religion.scientology. And we thank him for his endorsement. 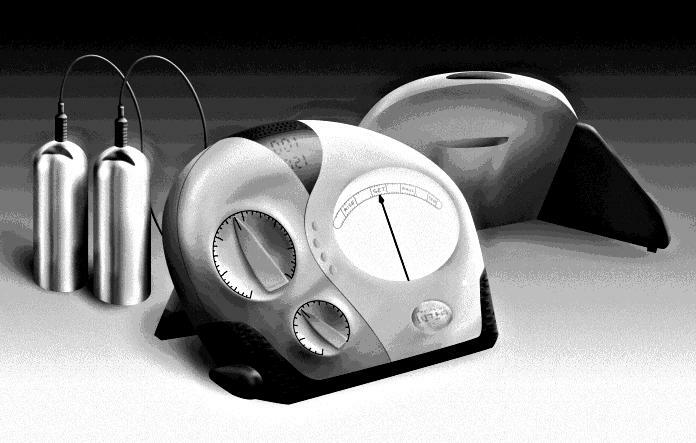 Peter Alexander's Scientology parody, an independent film called The Profit, features a device called a "mind meter" that is modeled after Scientology's own E-meter. You can see more pictures at The Profit: the Movie Scientology Won't Let You See. The movie's official web site is www.TheProfit.org. Back to the main "Secrets of Scientology" page.